← Back: What does the future hold? This year’s top ten organizations tell a story about our preoccupation with new ways to enhance human potential. This begins with the technology companies like Google, Apple and Samsung helping us to communicate, organise and instantly access the world’s information, map our journeys and make our cars driverless, access content and services from any location and free people from the burden of manual processes in the same way that domestic appliances transformed the quality of 20th century life. And it goes further into the sharp rise in perception strength of biopharmaceutical and biotechnology organizations like AbbVie, Gilead and Celgene that are at the frontier of research into technologies that prevent and treat disease at the cellular and biomolecular level, unleashing the potential of human biology to improve peoples’ lives. But it also reflects the power of human communities, united behind archetypal stories and experiences of the kind created by Walt Disney, or around the universal social bonding enabled by the products of SABMiller across every culture and demographic, and the need to move beyond consumer materialism towards a celebration of human experience and our capacity to pay for the things that matter most with MasterCard. 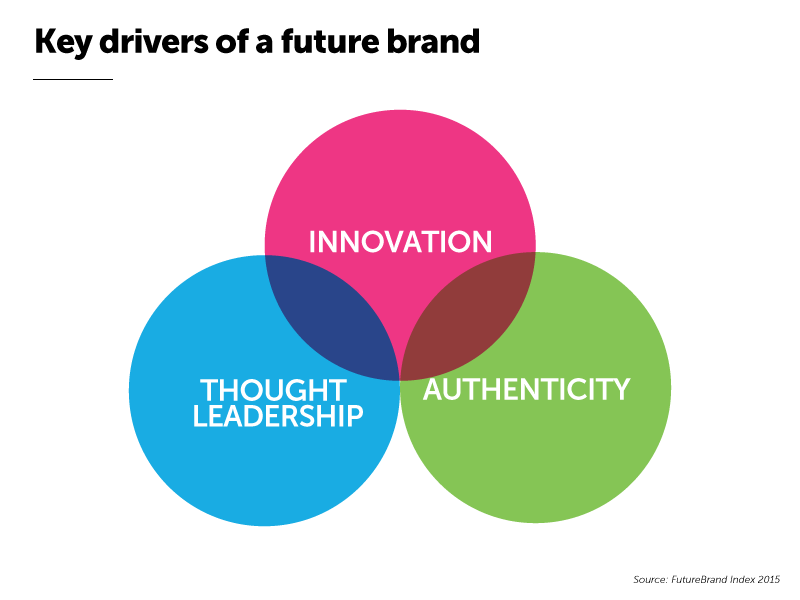 These ‘future brands’ all share strong, balanced perceptions across both purpose and experience, managing to unite ‘why’ they are here with what they deliver in practice, and chart the drivers of future organizational success as a result. But they also typify our increasing focus on organizations that help us to tame and improve ourselves, not just the world around us. "I've placed my savings in the company [ICBC] and I believe that will be a company that represents me." Last year’s research showed that our global respondents had relatively weak perceptions of the world’s largest Chinese organizations against our measures, despite significant general interest in Chinese financial and manufacturing power, but that companies like ICBC and Tencent Holdings were most likely to be ‘moving forward’ in three years as they extended their reach beyond China into international markets. To support this prediction, a key finding this year is the increase in perception strength of these companies and their overall rank position – with Tencent climbing eight places, ICBC up four places, Agricultural Bank of China up twenty nine places and organizations like Ping An Insurance entering the top 100 for the first time at 19th position. And China has now moved to second position in terms of the number of companies in the PwC Top 100 ranking (up from 8 in 2014 to 11 in 2015), second only to the US. Even though it has a negative ‘cap gap’ in this year’s research, Alibaba’s historic initial public offering (it was the only company to enter PwC’s rankings by IPO this year) and the interest this generated in its business reach and operations, as well as reported investment interest in mainstream western brands like Yahoo! and new players like Snapchat, has broadened respondents’ general understanding of the reality behind the hype of Chinese international companies and helped them to move from ‘admiration’ to feeling ‘closer’ in their minds. "Ping An insurance is constantly innovative and service-oriented." Importantly, this year’s research is not only showing stronger quantitative perception strength across our measures, but also a growing qualitative view that Chinese organizations are ‘efficient and service orientated’. As they begin to demonstrate their value and benefit to people outside China through first hand experience – for example, ICBC has retail branches with customers in over 60 countries – we expect to see Chinese global organizations at the vanguard of a more rounded set of perceptions of this sort. Helping to move China from a one-dimensional stereotype of financial power and scale as understood by the west, towards a more complex reality that will inform 21st century life as a reflection of authentic experiences. If we have found a general strengthening of perception of Chinese organizations this year, there has been a correlative weakening in perceptions of some of their American counterparts. 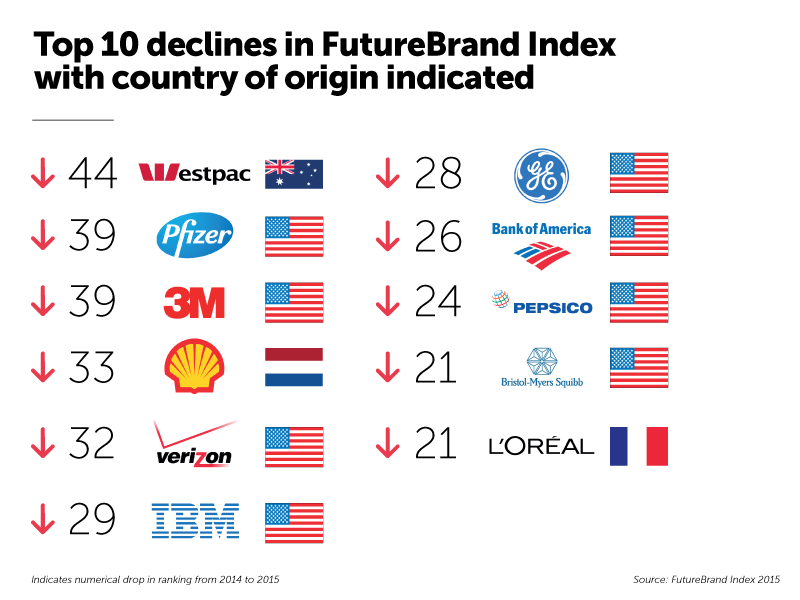 Indexing for overall average changes in perception strength and the impact of new entrants, the largest negative ranking movements have been of US companies. For example, Visa (down 21), IBM (down 29), GE (down 28), Berkshire Hathaway (down 23), PepsiCo (down 24) and Bank of America (down 26) have all fallen over 20 places, while Pfizer (down 39), 3M (down 39) and Verizon (down 32) have moved down the ranking by over thirty places. Some of these movements contradict the perceptions captured last year, including respondent conviction that Pfizer would be one of those most likely to be ‘moving forward’ in three years time. But the broader trend is part of our evidence for weakening of relative perception strength of organizations that powered 20th century life, but that are now competing with organizations at the forefront of new macro forces in the world. Interestingly, the number of US companies in the PwC ranking has increased to 53 in 2015 (from 47 last year) and they are among the top risers in market capitalization across the board this year. Not just that, but the US has the highest combined market capitalization of national Global Top 100 companies ($9.3 trillion). The negative cap gap in many of these cases reinforces the argument that financial size does not insulate organizations from weak or declining perception strength by our measures regardless of sector. 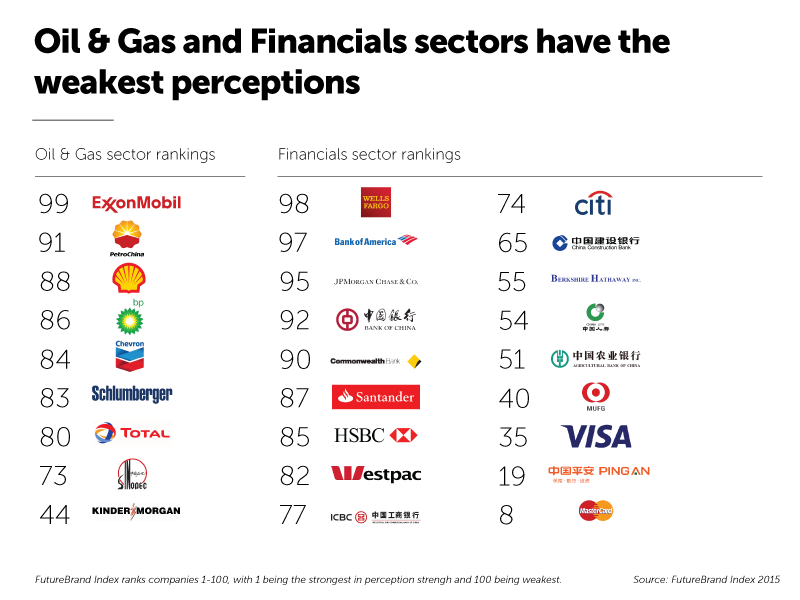 The financial services and oil & gas sectors had the largest negative ‘cap gap’ in 2014 and this continues to be the case in 2015, with the largest individual gaps in the top 100 for ExxonMobil and Wells Fargo However, while perception strength across our measures is weakest for these categories (we have also seen a weakening of perception in consumer goods this year), there is a marked change in sentiment towards them compared to 2014. In particular, our respondent feedback on banks has moved from a general criticism and negative feeling to more neutral and constructive suggestions about what they could do to deepen customer relationships around improved service and experience. Similarly, while there is still a focus on the need for ethical behaviour, this has been displaced by an interest in oil & gas, financial services and basic materials companies continuing to invest in innovation and finding new sources of energy and resources, as well as forging stronger relationships and balancing a focus on profit with ‘giving back’ to the communities in which they operate. This general shift away from actively ‘blaming’ specific sectors for broader environmental and macroeconomic problems, towards acknowledging their role in society and describing the areas they should focus on for renewed success, perhaps opens up opportunities for some of the leading companies in these categories to encourage reappraisal of their contribution by demonstrating the positive impact they are able to have. "Bank of America have a proven record of excellence and have made huge strides over the last few years." 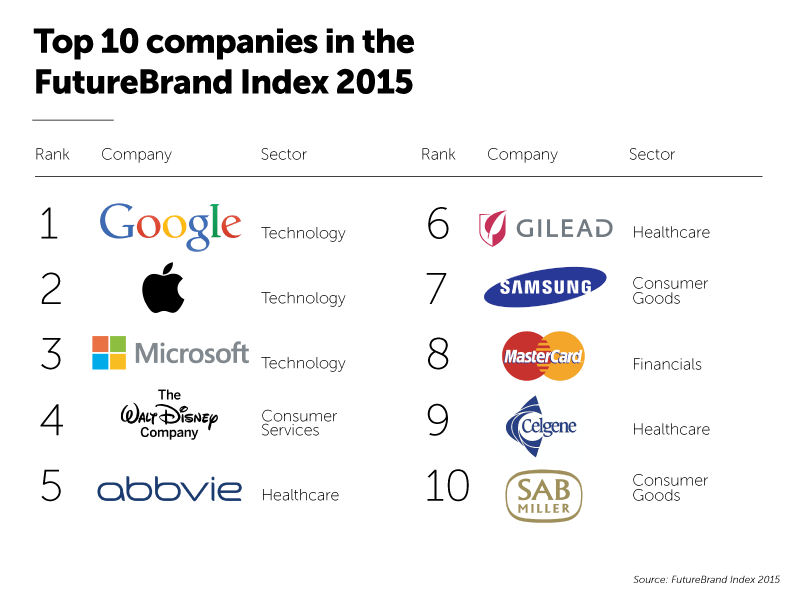 In 2014, we demonstrated that there are a series of key drivers of a ‘future brand’ – things that stand out as major differentiators between organizations with the strongest and weakest perceptions in our research. These most significantly related to the attributes of thought leadership, innovation and authenticity – vital attributes of ‘purpose’. In our model, organizations with strong perceptions of thought leadership are seen to be driven by clear ideas and unafraid to express clear views about their category, market or the broader world. Innovation is best understood as providing new things that are useful. This means the organization is seen to go beyond change or novelty for its own sake, and instead focus on inventing products, services or experiences that are genuinely useful. And finally, when it comes to authenticity, organizations can have a lofty vision, but that vision needs to be seen to connect genuinely to its primary task or the qualities of its products and services. Want to know more about our key findings? Get in touch to find out more about the data behind these findings and how you can make use of them for your organization.